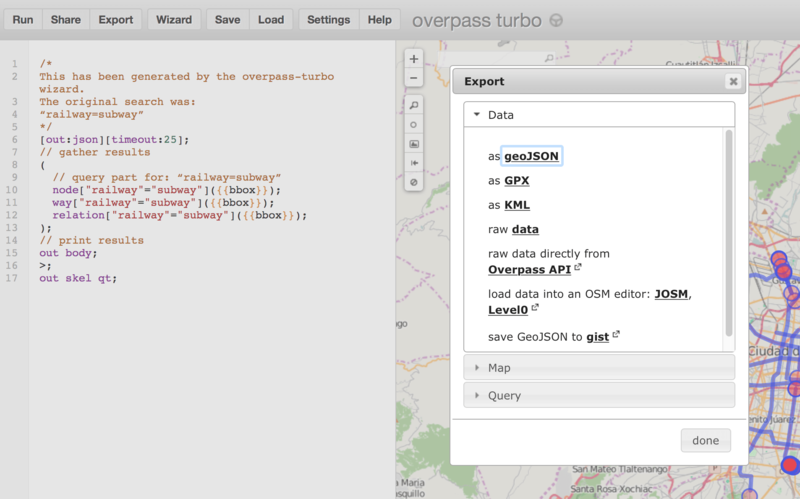 It’s possible to use Overpass Turbo to extract any object from the OpenStreetMap “planet” and convert it from a GeoJSON or KML file to a shapefile for manipulation and analysis in GIS. Say you want the subway lines for Mexico City, and you can’t find a GTFS file that you could convert to shapefile, and you can’t find the right files on Sistema de Transporte Colectivo’s website (I didn’t look for it). 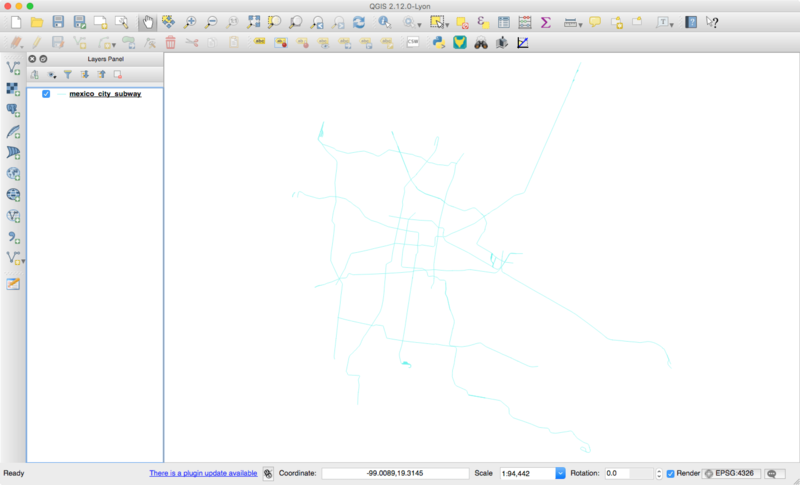 Here’s how to extract the subway lines that are shown in OpenStreetMap and save them as a GIS shapefile. This is my second tutorial to describe using Overpass Turbo. The first extracted places of worship in Cook County. I’ve also used Overpass Turbo to extract a map of campgrounds. In the Wizard dialog box, type in “railway=subway” in order to find metro, subway, or rapid transit lines. (If you want to download interstate highways, or what they call motorways in the UK, use “highway=motorway“.) Then click the “build and run query” button. In a few seconds you’ll see lines and dots (representing the metro or subway stations) on the map, and a new query in the text area. Notice that the query has looked for three kinds of objects: node (points/stations), way (the subway tracks), relation (the subway routes). Download the data by clicking the “Export” button. Choose from one of the first three options (GeoJSON, GPX, KML). If you’re going to use a desktop GIS software, or place this data in a web map (like Leaflet), then choose GeoJSON. Now, depending on what browser you’re using, a couple things could happen after you click on GeoJSON. If you’re using Chrome then clicking it will download a file. If you’re using Safari then clicking it will open a new tab and put the GeoJSON text in there. 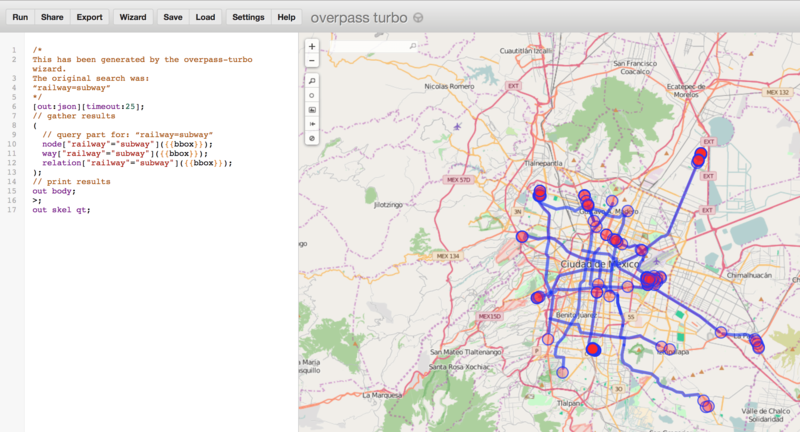 Copy and paste this text into TextEdit and save the file as “mexico_city_subway.geojson”. Screenshot 1: After searching for the city for which you want to extract data (Mexico City in this case), click the “Wizard” button and type “railway=subway” and click run. 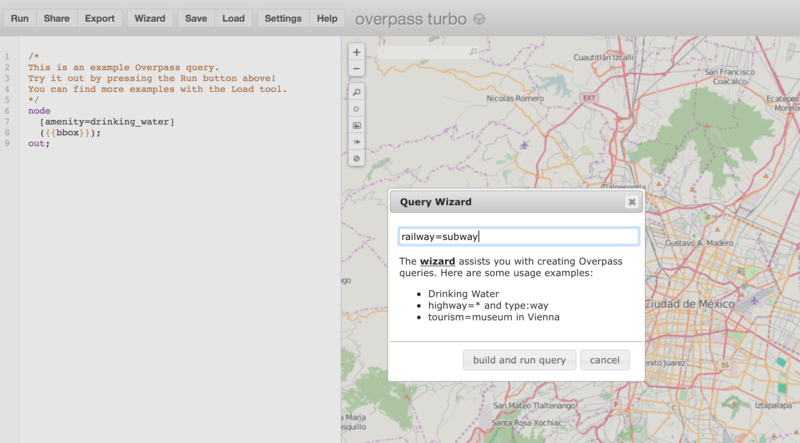 Screenshot 2: After building and running the query from the Wizard you’ll see subway lines and stations. Screenshot 3: Click the Export button and click GeoJSON. In Chrome, a file will download. In Safari, a new tab with the GeoJSON text will open (copy and paste this into TextEdit and save it as “mexico_city_subway.geojson”). After you’ve downloaded (via Chrome) or re-saved (Safari) a GeoJSON file of subway data from OpenStreetMap, open QGIS, the free and open source GIS desktop application for Linux, Windows, and Mac. 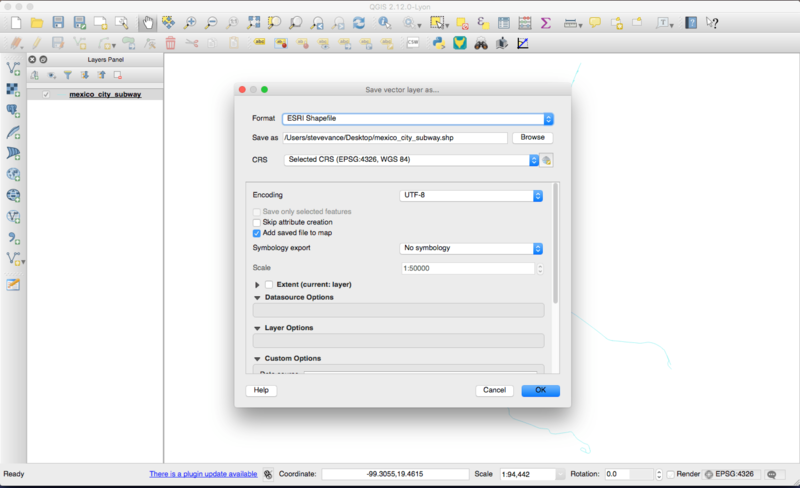 In QGIS, add the GeoJSON file to the table of contents by either dragging the file in from the Finder (Mac) or Explorer (Windows), or by clicking File>Open and browsing and selecting the file. In the “Save As…” dialog box choose “ESRI Shapefile” from the dropdown menu. Then click “Browse” to find a place to save this file, check “Add saved file to map”, and click the “OK” button. A new layer will appear in your table of contents. In the map this new layer will be layered directly above your GeoJSON data. Screenshot 4: The GeoJSON file exported from Overpass Turbo has now been loaded into the QGIS table of contents. Screenshot 5: In QGIS, right-click the layer, select “Save As…” and set the dialog box to have these settings before clicking OK.